Cost is sacrifice of economic resources for example purchase of machinery, raw material etc and Expense is expired cost that charged against revenue in particular accounting period say depreciation, rent etc. Cost of production/manufacturing consists of various expenses incurred on production/manufacturing of goods or services sold. These are the elements of cost which can be divided into three groups i.e. Material, Labor and Expenses. Direct Material is that material which can be easily identified and related with specific product, job, and process. Timber is a raw material for making furniture, cloth for making garments, sugarcane for making sugar, and Gold/silver for making jewelry, etc. are some examples of direct material. Labor which takes active and direct part in the production of a product or providing services. Direct labor is that labor which can be easily identified and related with specific product, job and process. Direct labor cost is easily traceable to specific products. Direct labor varies directly with the volume of output. Cost of wages paid to carpenter for making furniture, cost of a tailor in producing readymade garments, cost of washer in dry cleaning unit are some examples of direct labor. All cost incurred in the production of finished goods other than material cost and labor cost are termed as expenses. 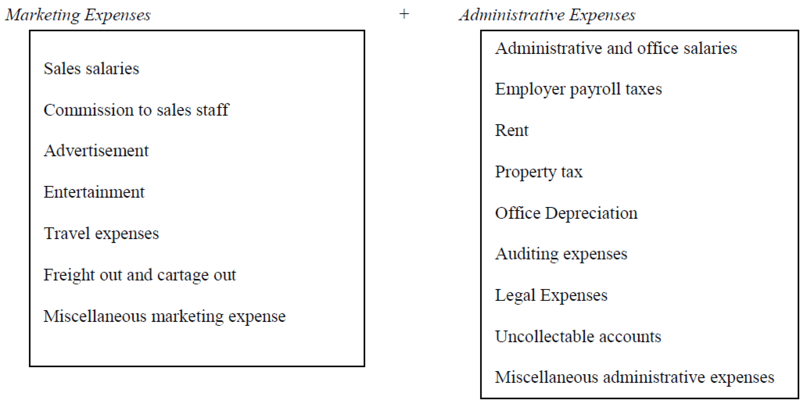 Expenses are classified into two categories i.e. Direct expenses, and Indirect expenses (Factory Overheads). These are expenses which are directly, easily, and wholly allocated to specific cost center or cost units and charged to direct material section. All direct cost other than direct material and direct labor are termed as direct expenses. Some examples of the direct expenses are cost of wages, inward carriage and freight, cost of patents, royalties etc. These expenses cannot be directly, easily, and wholly allocated to specific cost center or cost units. All indirect costs are indirect material, indirect labor and indirect expenses. 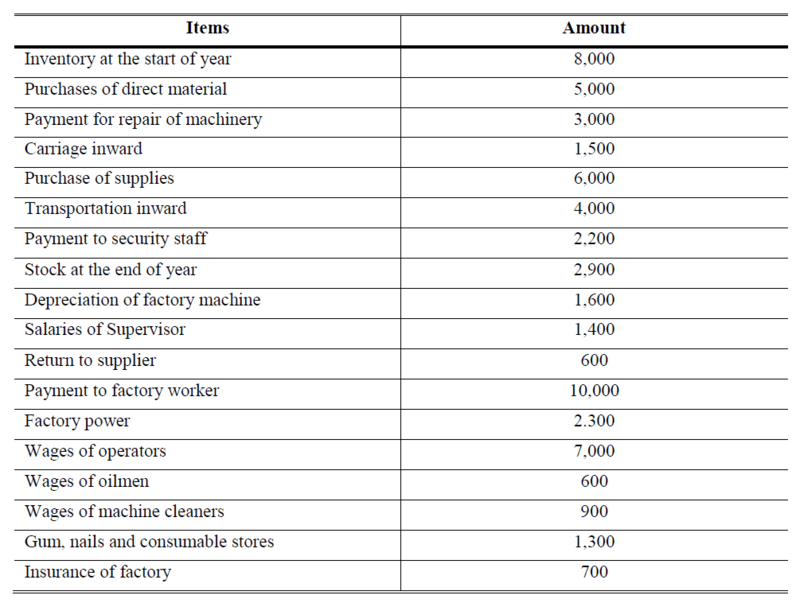 Thus, indirect expenses are treated as part of Factory Overheads. Small tools, brushes for sweeping, sundry supplies etc. Salary of factory manager, foremen, supervisors, clerks etc. >> Practice Costing Problems and Solutions. The following information has been taken from company records. You are required to calculate Direct Material, Direct Labor and Factory Overhead? >> Further Practice Cost of Goods Sold Problems and Solutions. A company’s net revenue minus its cost of goods sold or cost of sales. 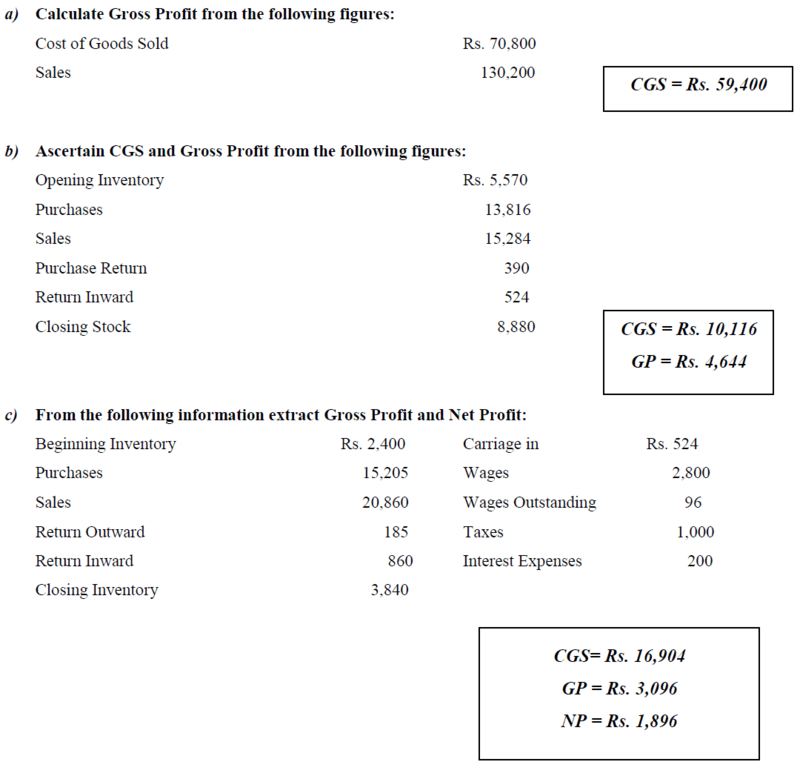 Operating profit is gross profit minus commercial expenses of the company. Net profit is operating profit minus (financial charges, taxes and other expenses) plus other income. 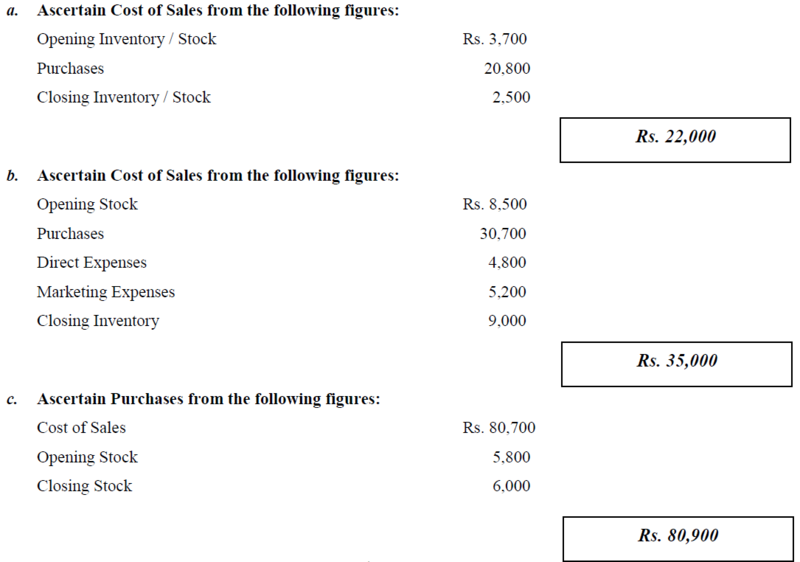 >> Practice Cost of Goods Sold MCQs. >> Practice Costing Quiz 1 and Quiz 2.